How many of you are familiar with the term, Hygge? And, if you are, are you even pronouncing it right? Before reading ‘The Little Book of Hygge’ by Meik Wiking, I had no idea that it was actually pronounced ‘hoo-guh’. Mind you, I’m still getting my head around the word Quinoa, so it’s no surprise really. Apparently, the way it’s said and spelt really isn’t the important thing. It’s how it’s felt. Hygge is all about feelings. It’s the Danish way to ‘live well’. It’s an atmosphere. An experience; the idea of feeling totally safe, comfortable and ultimately happy in your surroundings. I’m pretty sure it’s my favourite word – I mean feeling. To me, Hygge conjures up cosy thoughts of blankets, oversized slipper socks, endless amounts of tea, Netflix-binging and delicious scented wax melts. It’s a warm place with the ability to sooth an anxious mind and calm the soul. I’m sure I’m not the only one who craves days like this, especially at this time of year. This is the Hygge season. If you are like me, then you probably spent the weekend enjoying the delights of Bonfire Night. Because, Monday evening is not the ideal time to venture out in the cold after work, is it? Anyway, even going out in itself could have been considered a Hygge moment. Winter coats, gloves and your trusty bobble hat. That’s pretty cosy. Enjoying the company of your friends and loved ones, whilst having your first Mulled Wine of the year, I’d say that’s very Hygge. But, of course, tonight is the actual night. So, I reckon… give dogs a little break from the noise and have a Hygge night in, instead. Dim the lights, burn candles, pop on your PJs, grab some treats and set yourself up for an evening of calm. At this point, you are probably imagining yourself curled up on the sofa -which is great. But, Hygge isn’t just about the living room. The kitchen is a perfect ‘happy place’ too. Surely, the hub of your home must encounter the most Hygge moments? Afterall, it is where that magnificent scent of coffee wafts from and the place where your autumnal soup gently simmers. I’ve shortlisted my favourite Hygge concepts for the kitchen – enjoy! Warm colours have the ability to transform any room from ‘just a space’ into Hygge Headquarters. In the kitchen, this can be achieved with beautiful painted cabinets or seasonal accessories. Wood plays a huge role in the Hygge show. Wood in the kitchen makes us feel closer to nature; it is simple and natural, just like the concept of Hygge. Styling your dresser with beautiful ceramics is sure to give you that warm Hygge glow. Create a Hygge moment by adding a bespoke bookshelf and showcasing cookbooks. Butler sinks are not only incredibly easy on the eye, but they also enhance that cosy farmhouse feeling. The ultimate Hygge vibes come from comfort food, especially at this time of year. I can’t think of anything more Hygge than home cooking on an Aga. Can you? Have you heard of a ‘Hyggekrog’? 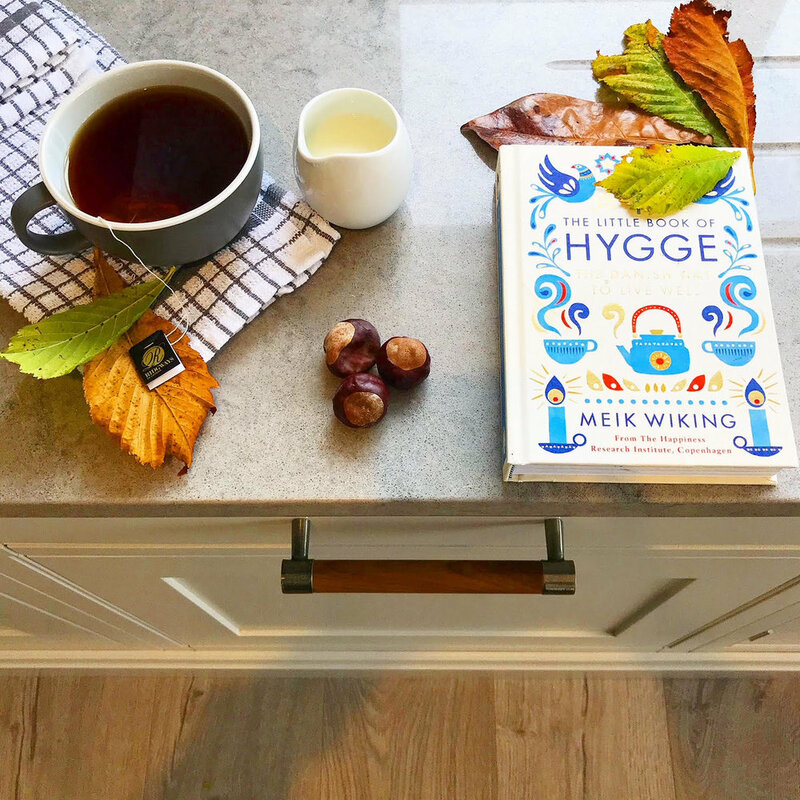 According to ‘The Little Book of Hygge’ it’s the one thing that every home needs. It roughly translates as ‘a nook’ and is the place in a room where snuggling up under a blanket, reading a book and stargazing out the window happens. The more I read about ‘Hyggekrog’, I discover most Hygge lovers have found this special place in their kitchens, of course. Enjoy your night in, I know I will.